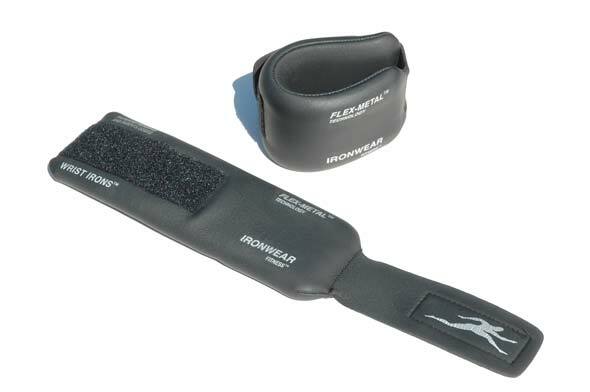 Club Wrist-Ankle Irons™ are IRONWEAR ™’s top of the line wrist and ankle weights. They are covered by a patented soft durable glove leather surface which feels nice and blocks sweat from being absorbed. Club Wrist-Ankle Irons™ besides being more comfortable, can be easily wiped off, cleaned and sterilized. They are ideal for heavy use and multiple users. 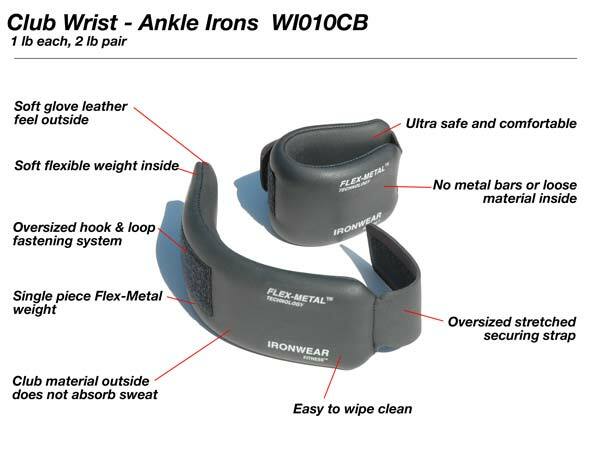 Club Wrist-Ankle Irons™ consist of a single thin layer of IRONWEAR ™’s patented Flex-metal™ which wraps around the wrist or ankle. The ends of this patented weight are tapered to maintain uniform friction with no pressure points. Club Wrist-Ankle Irons™ have an over sized coated neoprene strap which adjusts the weight to the desired tension on any size wrist or small to medium size ankle. The design creates a comfortable fit with no movement or rotation. Club Wrist-Ankle Irons™ flex and move with you. They do not move around, sag or distort like weights filled with sand or metal shot. Club Wrist-Ankle Irons™ are safer than other weights and act as padding in case of a fall. They will not damage or bruise you skin like weights made with metal bars. Club Wrist-Ankle Irons™ are thin simple design and can be worn under sweat shirts or pants.